By His Hands: Tastes Like Chicken? I've been out of school for many years now, many many years, and I think I enjoy learning now a lot more than I did then. I like watching the Discovery and History channels as well as reading about science and history. One of the curious things I learned some time ago was about certain habits of the praying mantis. At the time I thought, oooookay that's gross and tucked it away some where in my head. Well last week I came face to face with this particular action in progress. What was it you say? It was a day like many many other. I was at the store working when I had to got out the back door for some task or other. This door faces east and the brick was being warmed by the sun. I finished my business and headed inside when to my horror what did I see on the side of the building but two praying mantis. Now this in itself was not the frightening part for there were several mantis scattered on the brick, but what these two were doing... oh the humanity. You see, one of the facts I learned and stored away was about the mating habits of the praying mantis, after they do the hokey pokey the larger female grabs hold of the smaller male and makes a feast of him! 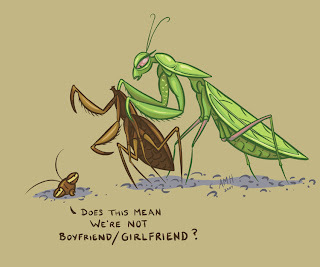 There before my eyes was large green and brown mantis with a partly eaten male in her claws! My thoughts immediately went to the other mantis guys on the wall. "RUN", I thought, "She's not that attractive". I don't know if any of them fell for her wiles but I did wonder, do they taste like chicken? Yuck! Nothing like seeing science in action! That is funny but gross at the same time. I love your cartoon! Must be true love - they're willing to die for it!